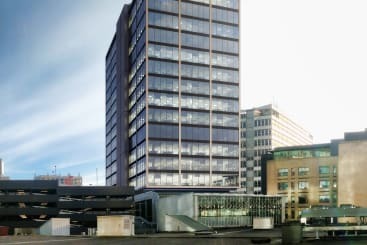 Owners of the Merrion Centre, Leeds based property investor and car park operator, Town Centre Securities PLC (TCS), has submitted a planning application for a 17-storey office and retail development at the Central Square in the Merrion Centre. Over the last decade TCS have undertaken a phased redevelopment and refurbishment of the Merrion Centre transforming it into a busy, relevant, mixed-use destination. The company has invested more than £70M of capital in the last five years delivering a number of projects including the completion of the development of Merrion House, an ibis Styles Hotel with adjoining Arnold’s Restaurant & Bar and refurbished 1100 space CitiPark car park. The proposed new Building will sit above the Home Bargains store with plans including the creation of a new central welcome hub, co working offices and brand-new head office building for StepChange Debt Charity. The building, currently known as 100MC, will offer over 10,000 sq ft of ground floor retail space for a refurbished Home Bargains store and 168,810 sq ft of commercial office space over 16 levels. It is anticipated that 100MC will be the place of work for circa 2000 people. “We have identified considerable latent opportunity within our Merrion estate which we believe provides a platform for future growth and we are therefore delighted to submit this important planning application, launching our second 10-year strategy for the Merrion Centre.